Alfie (like Ben Dijkstra) has been a member of our training group for over six years. In that time Alfie has built a fine reputation at XC, Track, Road and Fell Running. 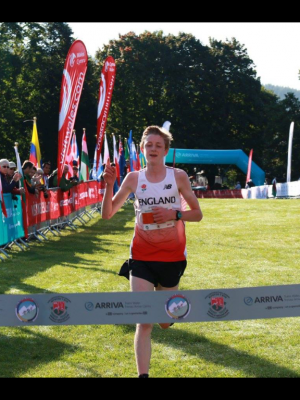 He has represented England at Mountain Running (2015 & 2016), winning the Home Countries U17M Mountain Running Championships 2015 (see image). Alfie has also represented English Schools at XC Running (2013). He is the current (2016) Midland Counties U17M XC Silver medallists. Alfie has contributed to a number of team winning performances for his club at Regional/National level, and for his county at National/English Schools level.